Urbanization and economic development are leading to a rapid rise in energy demand in urban areas leading to enhanced “Green House Gas” (GHG) emissions. Several Indian cities and towns are experiencing rapid growth in the peak electricity demand. The local governments and the power generation units are finding it difficult to cope with this rapid rise in demand and as a result, most of the cities and towns are facing electricity shortages and frequent shutdowns leading to production and man hour losses. Alternative sources e.g., in-house DG sets are expensive, clumsy and highly pollutant. Both Central and State Governments are extensively promoting alternative sources of energy to meet growing demands in rural and urban areas. With around 300 days of Sunshine every year, India has amongst the best condition in the world to harness Solar Energy. Rapid expansion of solar power can improve the quality of life of Indians especially poorest of poor. It can also create thousands of jobs in the Solar Industry besides improving environment, productivity and general health. 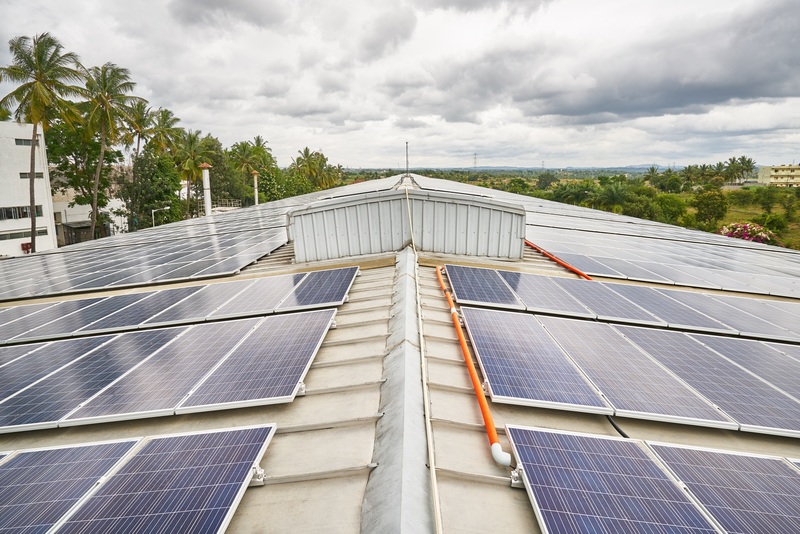 The Central Government has initiated various programmes in the urban areas to promote solar power for homes, hotels, hostels, hospitals and industries by execution of “Solar Photovoltaic Systems“ (SPV). The SPVs can be installed on fields, open areas and rooftops of the buildings and generate substantial quantity of power to meet in-house demand as well as feed into the Power Grid. 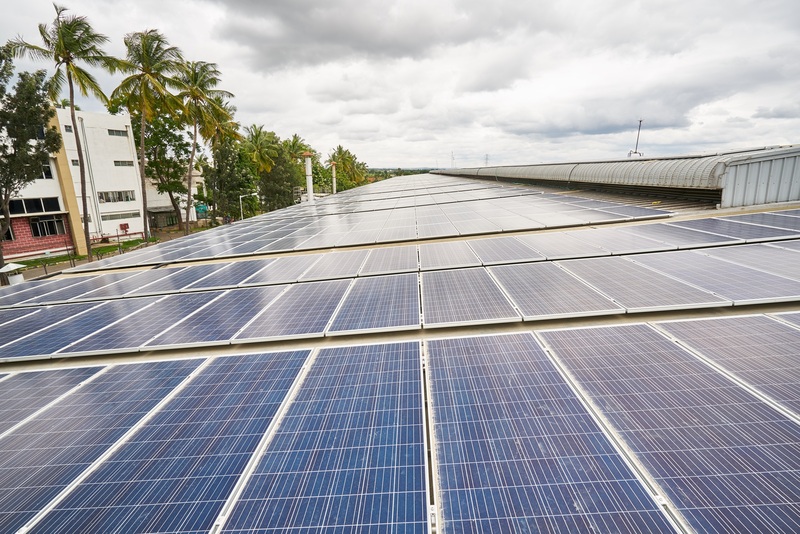 Karnataka Government has initiated ‘Rooftop Solar Generation’ Scheme for Industries and Farmers in the state wherein the producer can feed surplus power generated by the SPVs to the grid and help reduce the demand – supply gap. Featherlite, besides being a leading Furniture Manufacturer in India is also a responsible Corporate Citizen. The Company has achieved prestigious certifications e.g., Business and Institutional Furniture Manufactures Association (BIFMA) Platinum, ISO-9001, ISO-14001 and ISO-18001 based on various safety, health and environmental initiatives. The Company has also achieved Zero discharge and 100% recycling of its solid waste materials. 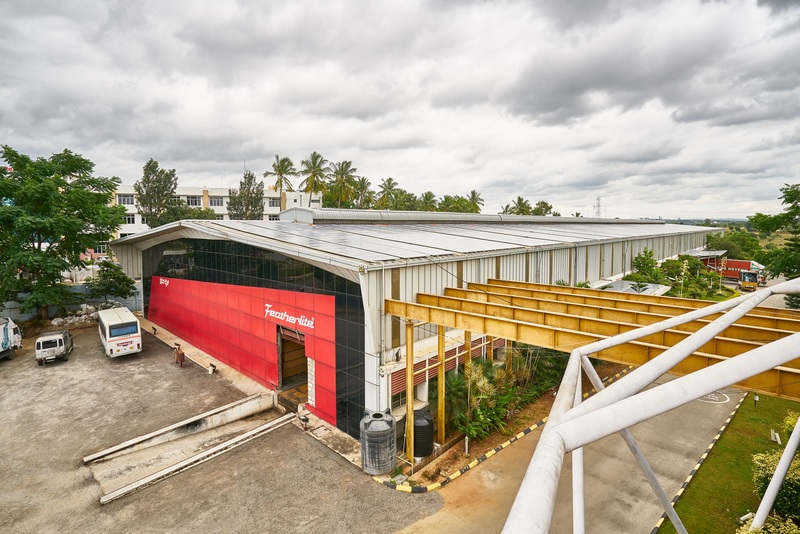 The “State of the Art” manufacturing unit located at Hejjala, 20km from Bangalore has a rooftop area of 70,000 sq.ft. 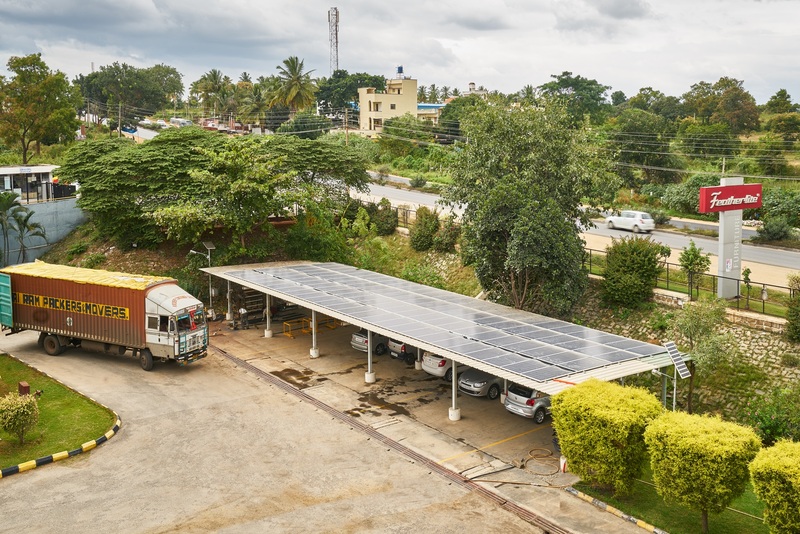 The Company has utilized every available roof space including canteen, two wheeler stand, car parking roof and canopies besides the main manufacturing unit in order to maximize the power generation. A total number of 3,000 solar panels each generating 320Wp of power per day have been imported from Canadaian Solar Inc. String invertors (16 numbers) manufactured by Delta Power Solutions Pvt. Ltd. support the power generation and transmission to Power Receiving Yard. The system has been integrated with State power supply Board and surplus power generated is fed into the grid. The system will produce 1.5 million units per annum of which 0.5 million units will be fed into the grid lighting scores of house holds. The plant was erected and commissioned by a team of well trained Engineers from M/s.GreenSol Renewable Power Pvt. Ltd., Bangalore and Featherlite in a record time of 30 days. This major initiative by the Company has reaffirmed Group’s commitment to minimizing environment degradation by reducing Carbon Footprint and helping the Government to achieve “Electricity for All” by 2020 goal set by the Prime Minister.